Through terrestrial and marine deep subsurface drillings to investigate the Earth’s interior, we have been learning the widespread occurrence of microbes of great diversity in deep subsurface. The activities of these microbes play important roles in the material cycles in Earth systems, and greatly contribute to the formation of natural gas fields and methane hydrate. They also contribute to the preservation of geoenvironment through degradation of toxic substances in soil and groundwater. Advanced knowledge about the activities of subsurface microbes is required for efficient exploration and exploitation of underground resources. It is also important for the development of technologies to mitigate groundwater and soil pollutions (geopollution). 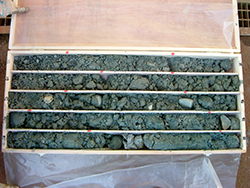 By applying geochemical methods such as isotope and lipid analyses together with microbiological methods such as tracer experiment, cultivation experiment, and gene analysis, and by collaborating with researchers within and outside AIST, we investigate the distribution, functions, and activities of subsurface microbes, aiming to contribute to the development of resources such as natural gas and to the utilization and preservation of geo-environments. Methane hydrate is widely distributed in marine sediments along continental margins and recently paid much attention to as new energy resources. 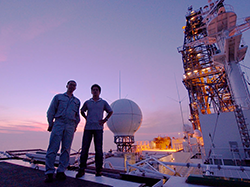 Methane forming hydrate is interpreted to be mostly produced by subseafloor microbes. However, it is not clear when and where the methane was produced. Methane in water-soluble gas fields in Japan indicates microbial origin. The methane has the same enigma as methane forming hydrate has. Our project is to aim to elucidate a formation mechanism of methane hydrate and water-soluble gas deposits. 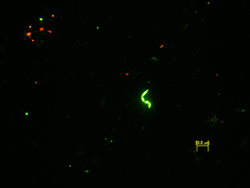 We research distribution and diversity of microbes around the natural gas-bearing regions and estimate their activities. More than 50% of crude oil remains unrecovered in the subsurface of depleted oil fields after full application of currently available technologies. Development of an innovative technology for enhanced oil recovery could increase available energy resources. In recent years, expectation is getting higher for the technology of microbial oil-to-methane conversion in the subsurface, which enables further recovery the oil as natural gas. To seek for this possibility, we conduct incubation experiments simulating the conditions of an oil reservoir in cooperation with INPEX Corporation and Tokyo Gas Corporation, aiming to elucidate the oil degradation and methanogenic pathways to identify microbes mediating the processes. Methane is 21 times more powerful a greenhouse gas than CO2. It is important to understand biogeochemical cycle of methane. 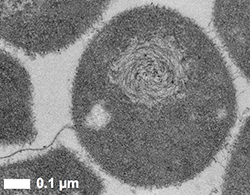 Microbes are responsible for not only methane production, but also methane consumption. Methane consuming microbes thus play an important role in controlling the emission of methane to the atmosphere from the geo-environments. However, we still do not fully understand this microbial process, especially anaerobic oxidation of methane (AOM). In a recent decade, anaerobic methane oxidizing archaea have been found to oxidize up to 80% of the methane produced in the marine sediments before its release into the hydrosphere. In contrast, many questions remain concerning AOM in the terrestrial environments; Who does it? Where is it? And how much is it? Our project aims to find the answers for these questions targeting shallow subsurface sediments in the Kanto Plain, Japan. Most of the available freshwater resources exist in the subsurface environments as groundwater. Subsurface contamination caused by human activities leads to a contamination of groundwater (geopollution), and this threatens human health. 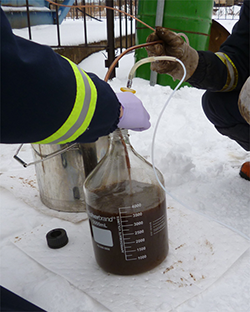 Bioremediation is one of the promising technology to mitigate the contamination. Contamination by the volatile chlorinated organic compound such as trichloroethylene and tetrachloroethylene can be treated by subsurface microbes such as methane oxidizing bacteria and anaerobic dechlorinating bacteria. We are collaborating with private companies to (1) develop low cost bioremediation technology utilizing groundwater in the natural gas field area which is rich in methane, and (2) develop bioremediation technology for the contaminated aquitards.